DataTag is pretty much the last line of defence when it comes to protecting your bike from thieving scum and with this Stealth Pro kit you can code your components as well as the frame. It certainly makes it a sensible investment for expensive bikes which tend to get broken up into parts before being sold on. The Stealth Pro kit has three pronged approach to making your bike traceable should the worst happen. UV stencilling, DataDots and deterrent labels are all used plus internet registration to store the bike's and your details. The process is so simple it did make me wonder why I hadn't actually got round to marking my bikes up in the past. In the box you get stencils showing the DataTag name, individual ID code and the phone number to contact should the bike be found. Each stencil has adhesive backing so that they can be applied to the frame and forks. Literally stick the stencil to the frame, apply the UV reactive liquid with the included cotton bud, leave for thirty seconds and remove. You can see the stencil as it leaves a white film on the details on removal of the stencil but using the supplied alcohol wipe it soon disappears. That's it, job done. DataTag supply you with four stencils to do frame, fork and two wheels but as my carbon rims are covered in transfers I didn't have anywhere to apply them so I just did a couple on the frame and one on the fork. Next up are the DataDots, microscopic dots which contain a unique code and the DataTag website address suspended in a UV sensitive glue. There are around a thousand of them in a small vial with a mini brush that you use to just dab them on your components. As each dot is only the size of a grain of sand they are never going to be seen by the naked eye once the glue has dried clear, thankfully though at the point of application the DataDots are darker in colour than the glue so you can at least see that there is one attached to the kit as you are applying it. To check that this has all worked I bought a cheap UV torch and turned out the lights and hey presto. The stencils are clear and bright under the black light as is the DataDot glue highlighting where the microdots are hidden. With a thousand to play with you can put the DataDots on each component a multitude of times in really hard to scan places so that a thief would never know for sure if they've got them all. Bear in mind though if you have a bare metal frame, i.e. no laquer, painting or powdercoating, you cannot use the UV stuff. You'll need to purchase the electronic transponder kit that DataTag sell for cycles. The tamper evident label wants to be placed somewhere visible (I went for under the downtube) so that it acts as a deterrent and once applied it can't be removed in one piece. It includes your reference number and a QR code. I registered the system at half seven on a weekday evening and by half eight the next morning my documents had come through confirming that my bike was on the database. This kit costs £26.99 which I think is good value for security marking that's permanent, well this side of a respray anyway. Apart from the physical product you are also getting membership to DataTag's database to which the police have 24/7 access. DataTag also supply police forces with free scanning equipment and training so if your bike gets retrieved there is a pretty good chance you are going to get it back. Should you want to sell your bike, DataTag supply documents for transfer of ownership, a bit like a V5 when selling your car. You have to provide the details and signature of the new owner and for a one off admin fee of about fifteen quid the database is updated. For the ease of installation and peace of mind it offers I pretty much think it's a no brainer to mark your kit up with the Stealth Pro. Its obviously not a replacement for good security but its an extra measure in place. You may also get a reduction in your cycle insurance of around 10%. 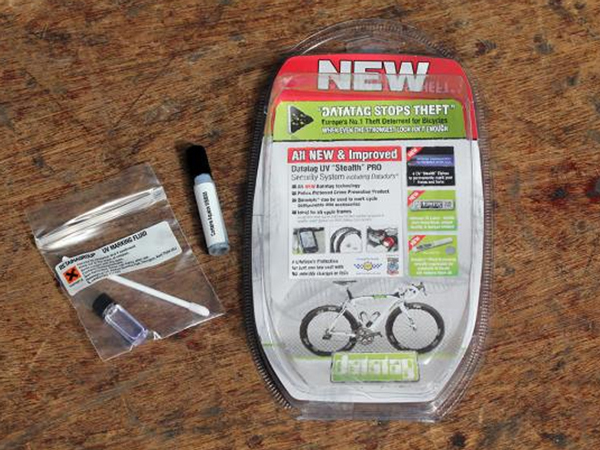 The Shield Pro kit uses UV sensitive liquids to mark your bike and components to help retrieval should it be stolen. DataTag provide police forces with equipment and training to enable the bike be traced back to you via the database. Its a simple system install with what looks like good results. The system contains 4 UV "Stealth" Etches to permanently mark your frame, forks and wheels. The unique, almost invisible UV etching system, form a major part of the risk deterrent and subsequent identification. These "stealth" UV etches won't visibly mark your cycle paintwork! These specially designed Datatag tamper evident labels contain a unique cycle identification number and QR code. 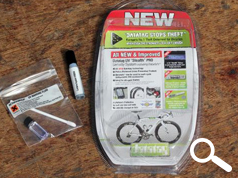 The Datadots® can be used to mark all your cycle components and accessories. The stencils are sharp and precise, so the results are clear on the frame. Everything stuck as it should and peeled off in the same way. Pretty much as above. The UV light picks everything up making it glaringly obvious that its been marked. The glue has dried hard and flat over each DataDot making them practically impossible to remove plus DataTag don't warn against using anything to clean your bike which would cause any issue. There are other systems on the market, such as Alphadots which uses similar microdot technology. Thats priced at £14.99 so with the four stencils added I think the DataTag is good value for money mostly because the stencils are going to be the easiest to find and permanent. A 10% reduction in your cycle insurance brings that value up to. Really well, it responds to the UV light clearly and everything was a breeze to fit. An option to upload photos to the database would be good for a visual verification. I think the kit is brilliant in its execution and can't really see much of a way round it without wasting huge amounts of time removing every DataDot if you can find them all. Obviously how effective it is comes down to the entire system and without out purposely getting my bike stolen I can't vouch for that.